Transport Certification Australia (TCA) has published the first instalment of consolidated rest area location and amenity information, making it available to drivers and managers via the Traveller Information Exchange (TIX) on TCA’s website. Last year, TCA announced that it would consolidate heavy vehicle rest area information in digital format, for use in navigation devices and services used by heavy vehicle drivers and operators. "As I stated in July, the consolidation of heavy vehicle rest area information, incorporating both formal and informal rest area locations, is long overdue," TCA CEO Chris Koniditsiotis says in a statement. "Despite general rest area information being offered through consumer navigation devices, heavy vehicle drivers face difficulties in finding in-cab devices and services which meet their specific needs. "Since July, we’ve taken rest area location data currently available from Australia’s road and transport agencies and translated it into a standardised form, which can be readily used by technology providers [by referencing the data definitions contained in the Telematics Data Dictionary – part of the National Telematics Framework]. "While rest area information was available prior, it was in different formats and retrieval methods across between sources." This new digital heavy vehicle rest area information complements the recent release of the Austroads Guidelines for the Provision of Heavy Vehicle Rest Area Facilities, which aims to help road managers assess the need and prioritisation for and design of heavy vehicle rest areas across the road network. 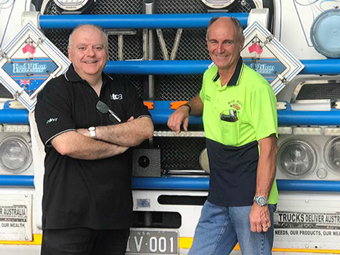 TCA is working with road transport and safety advocate Rod Hannifey to digitise existing road infrastructure that may be suitable for informal heavy vehicle rest locations. It says the provision of informal rest area demonstrates how crowd-sourced data can be disseminated in a standardised format through TIX. The first instalment comprises heavy vehicle rest area information in Queensland and South Australia. "Standardised heavy vehicle rest area information from both jurisdictions can now be accessed at no cost through the Traveller Information Exchange," Koniditsiotis says. just want the data in a standardised form. The information provided by TIX can be utilised by both commercial and bespoke systems as well as those who want the data in a standardised form. users to maintain the currency of crowd-sourced data (for example, when current rest areas are no longer available, or when new rest areas become available). "We encourage operators to consider the heavy vehicle rest area information" Koniditsiotis says.